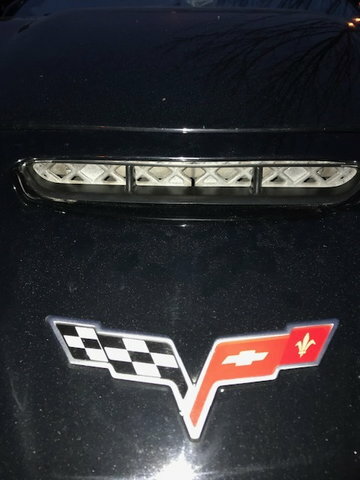 So today as I was washing my z06 I noticed that the air inlet scoop on the front bumper there is a little black plastic piece that is removable. Do you guys notice that your's bows in in the middle? Or doesnt make contact with the bottom of your bumper? No matter which way I place it it doesnt seem to make a good fit. Either the base isn't contacting the bottom of the bumper or the top isn't touching the top of the bumper. This is what I am talking about . See pic. Please check your corvettes and let me know. GS guys/gals are welcome to chime in too. And yes I know there is like 3M bonding tape on the base but if I replace that then it just sticks to the base and then the top is bowed even more. mine did the same thing after i had the nose off. it wasnt installed all the way in order to allow the clips to seat properly, i pushed it in until i heard a click, problem solved. So once u heard the click it made perfect contact with the top and bottom? I can make mine click but it’ll either be clicked in at top or bottom. If I make it flush with the bottom then the top isn’t and vice versa. Its plastic and sags over time. Just put some double sided tape on the top. Thanks for the suggestion however It will not reach both the top and the bottom if each is double sided taped. MTP I agree it is hardly noticeable. But do you see it on yours? So can you remove it to get cooling air into the engine bay? I mean I guess you could but it already has a few holes from the factory in the mesh behind it. I think removing it would add a host of water leak issues to the air intake assembly for minimal gains if any. At eye level, a tiny gap at the top..
bros, some of you really need to let go of the idea these cars are perfect. or any car for that matter. i know you paid "a lot of money" for it, but that does not change the fact these cars are essentially a big piece of aluminum with panels glued to it. hood, doors and hatch are bolted to the frame. basically everything else cosmetic is attached to a composite substructure glued to said frame. i have seen the hov lane plastic poles rip a c6z apart to the extent of thirty thousand dollars of damage. my perception is a little different for i am in the collision repair industry. all i am saying is do not sweat this little stuff. enjoy the car. Interesting that you mention this...being new to these cars, my first impression was how nice the paint is, but how the whole car is like a kit-car (or, Lotus) and how it would just disintegrate if it was crashed. Perhaps not structurally and the passenger compartment is obviously protected and complies with requirements. But, I’ve seen a couple ZO6 crashes at Watkins Glen (have the photos) and they were literally destroyed. One brought back in 2 pieces. I race in Champcar and WRL and we do some rubbing and yes, crashing...and that car survives some relatively big hits and gets bent back into shape. Yah, obviously not an aluminum frame or fiberglass/carbon panels. So, point is, I find this width and ‘fragile build’ aspect more intimidating than an issue with, say, potentially breaking loose under power or the rate at which it can cover ground. I find that driving the car and actually using it for practical tasks, is like the proverbial “bull in a china shop” type of experience. Last edited by tommyc6z06; 03-02-2019 at 10:37 AM. Any chance you could shoot a pic and post MTP? Its a black car and under the cover in my garage...I pulled the cover back and tried to take a picture, but it was pretty useless. If I pull the car out into some good light tomorrow, I’ll try again. Sounds good MTP. I appreciate it.